I haven’t kept tabs if this is fresh news since January but squares and colors now adorn the front page. The site looks good as the spots it’s showcasing and the content is just perfect in the mix of the colorful, sharp photos. The site is not quite finished as there are still some disabled links, but I’m pretty sure it’s a work in progress. With everything going mobile these days, it’s nice to see the site take a responsive design approach. It scales and adapts quite nicely on my Galaxy Nexus (if you disregard the squished wordings on the images) The web-font Open Sans couldn’t have been a better choice. I just don’t know about the long domain name. 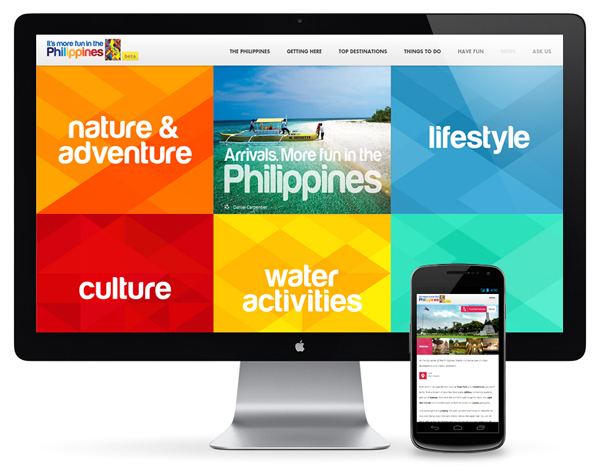 Maybe MoreFun.Ph would work as an alternative short domain?